When designing something, it is very important to have references of similar objects so you know what it is "supposed" to look like (most commonly images). Even for objects you think you know, you should probably look at real images, since it is extremely hard to accurately remember what they actually look like. 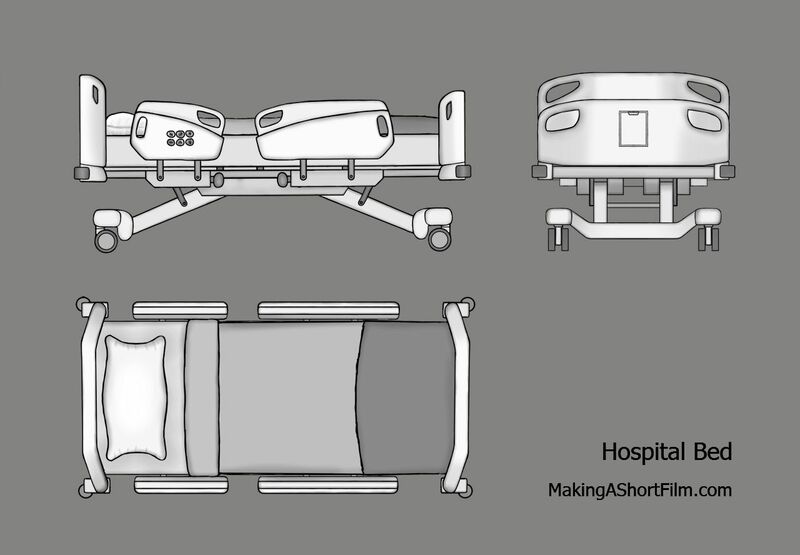 In the case of the hospital bed, reference images was 100% essential since I have been fortunate enough to spend very little time in or around a real hospital bed. I am really not sure what they should look like, or what functions it should have. So, when designing it, I scoured the internet for images and videos of them to try to find out what it should be. I then picked bit and pieces I liked from different ones, and based on them, created my own design as you can see here below. I want it to look realistic, so I have tried to make it mechanically functioning, much like the robot. You can change the height, as well as you sitting posture, which will be important in the scene where the Old Man in given his breakfast. Other key features includes moveable side-covers, so I can make sure that the Old Man can still see the window and other parts of the room, while still not being able to fall out. I have also attached a clipboard to the end of the bed. The Doctor will look at the clipboard in one scene in particular, when she pulls a "out of order"-sticker out of it. I don't want her to carry it at all times, so it should be easily accessible to grab while walking past the bed. As for the colors, I will go for a mostly white look, since it says hospital equipment to me. However, to better match it with the room it will be in, I will give it a bit more life with some accent colors. Since I have yet to design the rest of the room, I will wait with deciding which colors though, and keep the entire thing basically black and white for now. Now with the shape of both the EKG monitor and hospital bed done, I will move on to planning and designing the rest of the room, like where the furniture should be placed and the rest of the details/interior.